Gail is an unincorporated small town in Borden County, Texas, United States. Located at the junction of U.S. Highway 180 and Farm to Market Road 669, it is the county seat of Borden County. As of the 2010 Census, the population was 231. The town and county are named for Gail Borden, Jr., the inventor of condensed milk. Gail Mountain is located on the southwest edge of town. The 20th annual Christmas lighting of the star atop Gail Mountain was held on November 29, 2013. Mushaway Peak, a small but conspicuous butte, is located 4 miles (6 km) southeast. Founded in 1891 to coincide with the organization of Borden County, Gail has served as county seat for the duration of its existence. Borden County had remained quite sparsely populated until 1903, when the locally famed "War of Ribbons", inspired by a state-sanctioned land grab, took place. The conflict took its name from the practice of established ranchers displaying their affiliation and identity by way of a blue ribbon on their sleeves, whereas new settlers to the area designated theirs with a similarly placed red ribbon. By 1910, Gail was home to more than 700 residents, and though this would fall to 600 by 1912, the community remained the economic and administrative hub of Borden County. Changes in agricultural practices and patterns, coupled with the impact of the Great Depression, hindered the town and county's prosperity. By 1936, Gail's population had dwindled to 250 residents, and by 1980, it had fallen to around 190. The census of 2010 counted 231 residents in Gail. The Borden County Jail opened in 1896. Built at a cost of $4,500 by the Diebold Safe and Lock Company, it had 2-foot-thick (0.61 m) outside walls made of stone from Gail Mountain, and 0.3-foot (0.091 m) hardened steel plates in the cell walls and floor. In 1956, two prisoners objected to Sheriff Sid Reeder's attempt to place them into one of the jail's cells when they noticed a rattlesnake sleeping inside. A historic marker was placed outside the jail in 1967. John R. "Rich" Anderson, owner of the 64,000-acre (26,000 ha) Muleshoe Ranch near Gail, won the 1992 National Cattleman's Association Environmental Stewardship Award. His achievement was also recognized by the Texas House of Representatives. Gail is located near the center of Borden County. U.S. Route 180 runs through the town, leading east 31 miles (50 km) to Snyder and west 31 miles to Lamesa. Big Spring along FM 669 is 40 miles (64 km) to the south, and Lubbock is 72 miles (116 km) to the north. According to the U.S. Census Bureau, Gail has an area of 2.0 square miles (5.2 km2), of which 0.008 square miles (0.02 km2), or 0.38%, is covered by water. Gail is served by the Borden County Independent School District, and is home to the Borden County High School Coyotes. The school's Coyote Stadium is a six-man football venue and can seat 350. The Borden County Museum is located across from the post office, behind the county courthouse. Caprock Cafe lies deserted across from the Borden County Courthouse. Gail, Texas, is also the name given to a Census Designated Place which includes the town proper. The town is additionally the locus of the United States Postal Service's Zip Code of 79738. ^ a b c "Geographic Identifiers: 2010 Demographic Profile Data (G001): Gail CDP, Texas". U.S. Census Bureau, American Factfinder. Retrieved April 15, 2014. ^ Hunt, William R. "GAIL, TX". Texas State Historical Association. ^ "Rattler Killed in Texas Jail". St. Joseph News-Press. Oct 14, 1956. ^ Sasser, Ray (Feb 21, 1993). "Texas Cattleman's Land Management has Wide-Ranging Effect". Dallas News. 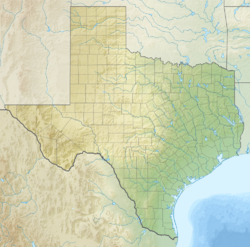 Wikimedia Commons has media related to Gail, Texas. This page was last edited on 4 December 2018, at 04:07 (UTC).